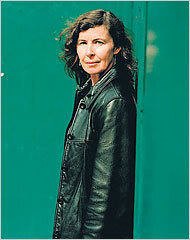 Margot Livesey is the author of eight novels, most recently, Mercury, published by Harper in 2016, as well as Homework; Criminals; The Missing World; Eva Moves the Furniture; Banishing Verona; The House on Fortune Street; and The Flight of Gemma Hardy, as well as a collection of stories, Learning by Heart. A collection of her essays on the craft of writing, The Hidden Machinery, was published by Tin House Books in 2017. She grew up in Scotland and earned a B.A. in English and Philosophy at the University of York in England. The fiction editor of Ploughshares, she has published stories in The New Yorker, Story, American Short Fiction, North American Review, TriQuarterly, and elsewhere. She has taught at Boston University, Bowdoin College, Brandeis University, Carnegie Mellon University, Cleveland State University, Emerson College, Tufts University, the University of California at Irvine, the Warren Wilson College MFA program for writers, and Williams College. Her honors include the L.L. Winship/PEN New England Award, and fellowships from the Guggenheim Foundation, the National Endowment for the Arts, the Radcliffe Institute, the Massachusetts Artists' Foundation, and the Canada Council for the Arts.